THE RUSSIAN Investment Forum, a yearly pow-wow for business bigwigs, bills itself as a platform for “presenting Russia’s investment and economic potential”. As the forum concluded in Sochi on February 15th, the country’s security services back in Moscow highlighted the risks of doing business in Russia by arresting Michael Calvey, the American founder of Baring Vostok Capital Partners, a Russia-focused private-equity firm, on fraud charges carrying a sentence of up to ten years. The image of Mr Calvey in the defendant’s cage sent shudders through the business community. The court’s decision on February 16th to hold him in pre-trial detention for two months will surely give other foreign investors pause. 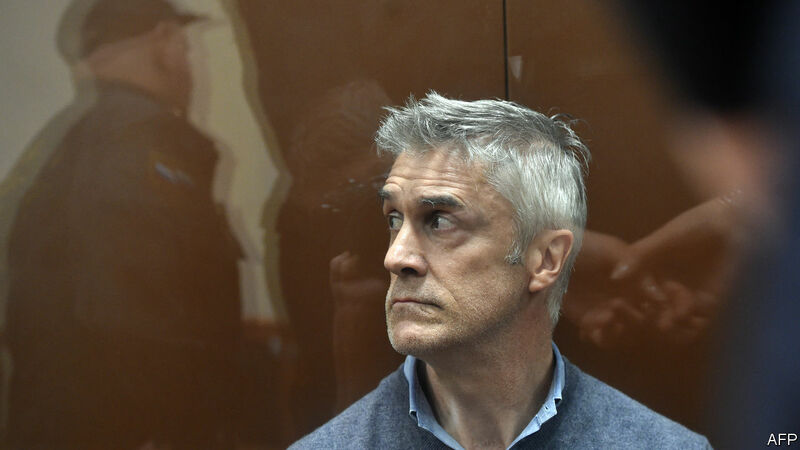 The arrest of Mr Calvey and three other partners stems from a battle for control over Vostochny Bank, in which Baring Vostok holds a 52.5% stake. Prosecutors allege that Mr Calvey and his associates embezzled $37.7m from the bank. Mr Calvey has called the charges baseless, and says they are the outgrowth of a conflict with two minority shareholders, Artem Avetisyan and Sherzod Yusupov, whom Baring Vostok accuses of fraudulently withdrawing assets from a smaller bank of theirs ahead of a merger with Vostochny in 2017. The dispute has gone to arbitration in London. The case against Mr Calvey was opened after Mr Yusupov complained to the Federal Security Service (FSB). The Bell, an independent Russian news site, reported that Mr Avetisyan has close ties with the country’s security services, including with the son of Nikolai Patrushev, the hawkish head of Russia’s Security Council. In the decades since Mr Calvey, a veteran of Salomon Brothers and the European Bank for Reconstruction and Development (EBRD), set up Baring Vostok in 1994, he has been unwaveringly bullish about the Russian market, through crises, recessions and geopolitical tensions. Even as other foreign investors wound down their businesses after Russia annexed Crimea and launched a war in eastern Ukraine, spurring sanctions from the West, Baring Vostok stayed. “Our instinct is to continue investing when all the investors around us are scared,” Mr Calvey told The Moscow Times in 2014. In total, Baring Vostok’s funds have invested $2.8bn in 80 projects in Russia and the former Soviet Union, across a range of sectors including technology, media, banking, natural resources, retail and telecommunications. The fund was an early investor in Yandex, Russia’s leading internet firm. Throughout his career, Mr Calvey developed a reputation as a straight-shooter who understood how to operate in Russia. “Of all the people I knew in Moscow, Mike played by their rules, kept his head down and never criticized the government,” tweeted Bill Browder, a financier who found himself in the Kremlin’s crosshairs more than a decade ago as the head of another private-equity firm. Many Russian business leaders immediately spoke out in Mr Calvey’s defence. German Gref, head of state-run Sberbank, Russia’s largest lender, called Mr Calvey “a decent and honest person” and said that he hoped the charges would turn out to be “a misunderstanding”. Kirill Dmitriev, the well-connected director of the Russian Direct Investment Fund, a state-backed sovereign-wealth fund, promised to “provide a personal guarantee” for Mr Calvey, praising his efforts to attract foreign investment in Russia. But if the security services’ interests are involved, even this support may not be enough to protect Baring Vostok.